Melbourne Cup Day is a national tradition where we put on our best dress and high heels for a day of fun, excitement and hopefully choose a few winners. 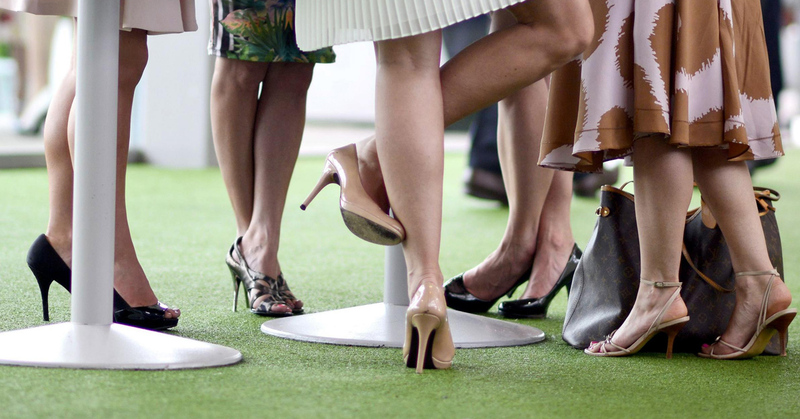 With a glass of champagne in one hand and a betting card in another, our feet often become our last priority. A majority of the day is spent standing, walking and wearing uncomfortable high heels that can leave you with blisters and aching feet, holding your heels. If you’re not a winner on the day, you don’t want to add sore feet to your list of losses. The right shoes: It makes sense to accessories a stylish dress with a stylish shoe, but it can often leave you with blisters and aching feet. You can still wear high heels, but choosing high heels which are well fitted to your feet and offer support will avoid injury and make the day more comfortable. A thicker heel for stability will relieve pressure and distribute the weight of your foot more evenly and offer better balance. Custom-made foot orthotics: Orthotics are shoe inserts designed to support the natural shape of the foot, improve posture and foot function in general. Orthotics support your feet and legs whenever weight bearing and improve weight distribution and posture, which is perfect for a day at the races. Rest: Resting between races by sitting down will do your feet a lot of favours. If you suffer from heel pain (plantar fasciitis), standing all day at the races is only going to aggravate the condition and cause agony. Visit a podiatrist: If you often suffer from sore feet and events such as the races can mean the dreaded aftermath of aching feet, visit your local Podiatrist. Your My FootDr podiatrist can do a full assessment of your feet and provide a recommendation on how to avoid foot pain. To avoid foot pain, book an appointment online or call 1800 FOOTDR today.